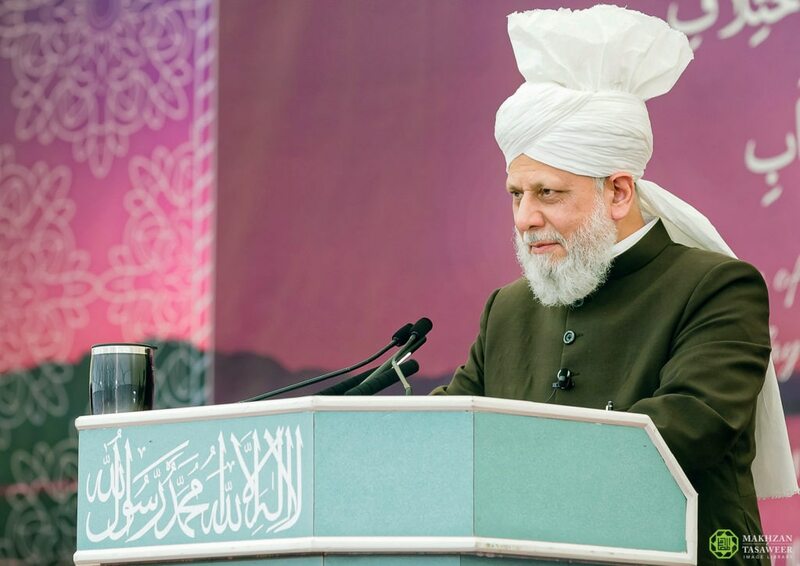 On 30 Sept ember 2018, the World Head of the Ahmadiyya Muslim Community, the Fifth Khalifa (Caliph), His Holiness Hazrat Mirza Masroor Ahmad delivered a moving and faith inspiring address to conclude the 40th National Ijtema (Annual Gathering) of Lajna Imaillah UK, the ladies auxiliary organisation of the Ahmadiyya Muslim Community. Held at Country Market in Kingsley, Hampshire, this two-day event served to inspire the women of the community to deepen their spirit of unity as Muslim women living in the United Kingdom and to join together in various programmes designed to stimulate spiritual, moral and educational training. In his address, His Holiness reminded Lajna Imaillah of the immense value of remaining firm in their faith and in being ever ready to offer any sacrifice for the sake of their religion and beliefs. 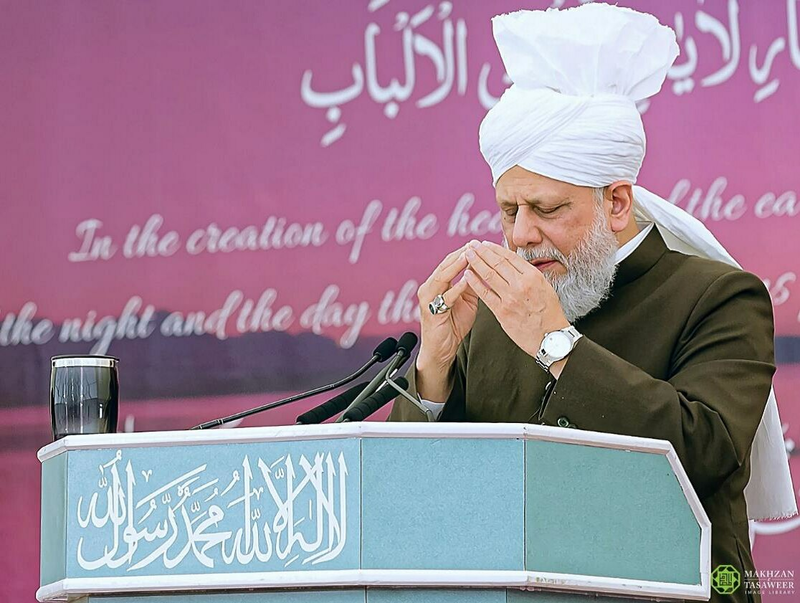 His Holiness urged Ahmadi Muslim women to live by the teachings of Islam and to inculcate a spirit of sacrifice for the sake of their religion and beliefs. His Holiness proceeded to present practical, real life examples of Ahmadi Muslim women who had made immense sacrifices for the sake of their faith and remained steadfast upon their beliefs. His Holiness narrated the incident of a woman in Canada whose husband forcibly threw her and her three children out of their home for accepting Ahmadiyyat. Despite previously living in relative affluence, after being removed from the family home she had to work as a domestic cleaner to make ends meet but never faltered in her resolve or faith. Hazrat Mirza Masroor Ahmad also described how Ahmadi Muslim women have given their lives for the sake of their faith and have been martyred. He mentioned a young Ahmadi Muslim mother of three living in Pakistan who, in 2011, was murdered in her own home by anti-Ahmadi opponents for the sole reason that she was Ahmadi Muslim. His Holiness also cautioned Ahmadi Muslims to ensure that their standards of faith never slipped and that they did not fall behind in practicing their religion. His Holiness advised Ahmadi Muslims to instil within their children the true and peaceful values of Islam so that they matured into ‘model citizens’ who were ever-ready to give whatever sacrifice was required for the sake of their faith and nation. His Holiness concluded the Ijtema with a silent prayer. 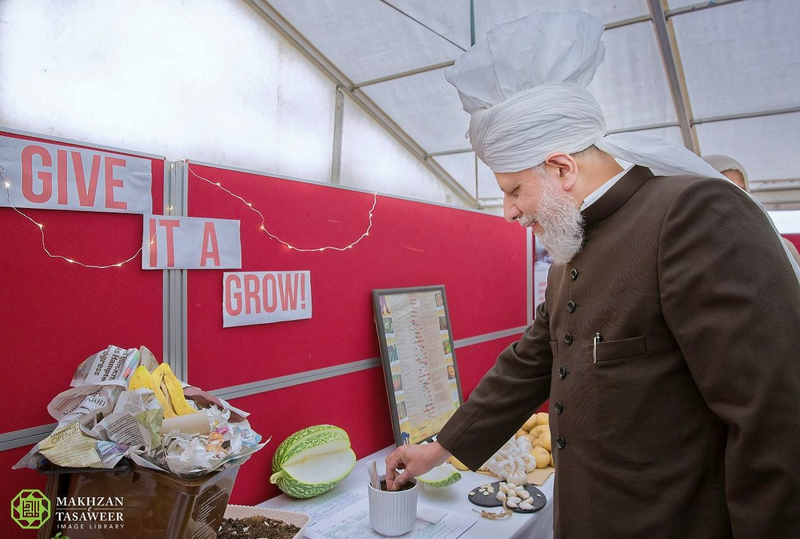 His Holiness also visited an educational exhibition set up by the ladies’ branch of the Ahmadiyya Muslim Research Association (AMRA) at the Ijtema which was based around ‘Science in the Holy Quran’. His Holiness visited the nature zone, where he planted a courgette seed and viewed a demonstration of a ‘smoothie drink’ being made by riding a bike. His Holiness also observed a water filtration system that was part of the exhibition.